Oh great, my other half mentioned adding a few small pieces of ice in the back overflow part of tank, carefully watching the temp. Too funny. Yes, on the current and species issue. Cool, so glad about the hardness recipe, can't wait to play the weird scientist and mess with this in a five gallon bucket. I promise, I sure won't add to tank directly. I don't know if you have ever experienced this, but I thought it was so neat. My Cory cats are mating, and the females clean the glass, carry the eggs between their bottom fins, and place the eggs on the walls of tank, and the plants. I was blown away, so darn cute. One of the great mysteries is how the sperm and eggs get together. Males shed their sperm in front of the female, but how she gets the sperm to the eggs is unknown, though one theory is she swallows the sperm, passes it quickly along her gut, and then sheds the sperm onto the clutch of eggs in her pelvic fins a few at a time. Pretty weird, I think you'll agree. Of course, after all that hard work, they eat them later, what a hoot. I don't mind, as this keeps fish population down. I feel bad for two of the Cory cats because even though I have provided them with fine sand, two of them have lost their whiskers, it is as though they have no lips at all, poor babies. They seem ok and still eat, they just look pathetic. Thank you for answering my questions several weeks ago about the fry. I have three fry left of the original 120 eggs and the largest is about 1.5 cm. They are about 15 weeks old. They were in a breeding net in a twenty gallon long tank. The net did not allow much air flow and trapped debris on it that could not be cleaned off within the tank and made the tank get a bad odor. I did do water changes of sorts in the net to try to counter these problems, but the pollution was still bad enough that I thought it was very bad for the fry. We had discussed letting the fry out of their tiny world before, and I did let the seven of them out when I tried to clean the net with a hose, brush, etc., but I believe nothing short of bleach would work. Within hours the fry began to go missing and during that time I purchased a plastic breeding trap for livebearers. The stores in this area had only ones sized small, which is considerably smaller that the original net. It is about 5cm by 13cm and 6cm to water level. Since I could only find three fry left I gathered them up into the breeding trap (I did not use the lid or the piece that can be put in to separate the adult from the young). They have been doing well in there for quite a while now and the vents in the trap provide good water flow and it looks so much cleaner than the net did. The plastic traps float, so they are much more convenient during water changes too. The net did not float and attached to the top of the tank with metal tabs that would often fall off and into the tank. My experience was that the plastic one is far superior to the net one, but a larger size would be very helpful. I have a second breeding box that has three fry from another later batch and I was pleasantly surprised that even when they were freshly hatched they did not escape through the vent. Last night one of the original fry must have jumped out of the trap as he is swimming with the adult Corydoras and Blackskirts today. 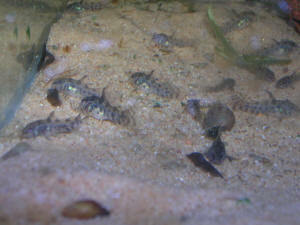 Is it possible that the three fry could have their growth stunted/lives shortened by the confines of the breeding trap? I am trying to decide if I should put the escaped fry back in the trap, or let the other two out also, or leave him in there for awhile and if he survives X amount of days then let the other two out. I would also like to know if it is advisable to keep different generations of fry together in a breeding box, or even add eggs in with fry. I'm attached to these cute fish! Thank you. The runaway fry still seems to be doing fine and since he is somewhat transparent (albino) I can see that his stomach seems to be full. I guess I'll leave him in there and see what happens. possibly get out or even get stuck. Luckily, none of them did. The problem with the Blackskirt that was getting picked on several weeks ago was also resolved (for now) when I moved things around in the tank. 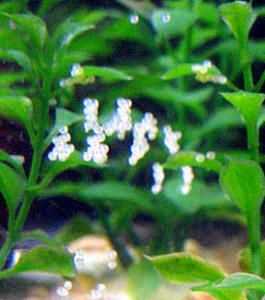 Just as you said there are new batches of Cory eggs over and over since they got started, every two to five weeks or so. If I ever find them in stock locally I plan to get some low light floating plants I have a list of or moss ball or something to put in the tank (after quarantine and maybe a de-snailing treatment). Almost four weeks ago I had a question about Albino Corydoras eggs and you gave me great advice about hatching them in a breeding net there in the main tank. I have been having a wonderful time with them. There were 120 eggs and there are now at least 70 fry visible at any time (don't know how many are hidden under the frame and the seams). The fry are now three weeks old. I have the big API water test kit so I am prepared to monitor the water throughout the next phases to detect problems, but perhaps your experience can help me better avoid problems to begin with. Initially I had planned to keep all the new Corys for myself, but there are many more than I expected since most of my Googling found about one-third hatching rates for beginners. I have already been wondering what to do if I find more eggs, leave them to chance or destroy them! Given the gregarious and bottom-feeding nature of Corys, how many adult Corys can live in a 20 gallon long tank (I have one vacant)? In an identical tank with seven Blackskirts, how many adult Corys can live in it? I do weekly water changes of maybe 20% on all my tanks. Since there are so many (some at 1 1/2 cm, some much smaller), I was wondering if it is about time to graduate the fry out of the breeding net. I have considered that they should probably have shallow water to surface easily, but am concerned about them having a world so big that it is a challenge for them to find food. They were initially fed Hikari First Bites and also brine shrimp, but they have also been introduced to Hikari bottom feeder food and tropical flake. Good early morning or late night, I have just found what must be Albino Corydoras eggs in my Cory and Blackskirt Tetra tank. This was unplanned (by me, anyway). I do have extra seeded filters in the tank so it is easy for me to take some of the water and start another tank, and I have brine shrimp to hatch and also Hikari First Bites (I don't know if that works for Corys). Since I discovered these eggs late at night I assume that they would have had time to be fertilized since I read that they usually spawn in the morning. I think it is interesting that they placed these eggs in an area that the Blackskirts never go to, near the surface, far from the plants, in the corner that gets the most light. I don't know what poses the greatest risk, moving the eggs off of the glass or leaving them in there where they can't be treated with something like Methylene blue for fungus. What is the shelf life of such chemicals? I ask because if I have any here it is several years old. Please forgive me if I have demonstrated a lack of thought as it is quite late tonight and I have been taken aback by the sudden prospect of kittens. I would send this as a reply, but I didn't get an email but rather saw my question in the dailies. This morning I found more eggs (at least as many as the other batch), this time on the opposite end of the tank down at the floor in what I would call the Blackskirt Tetra danger area. So far they have not been eaten and since I have read your answer I am going to go and buy a breeder net. I thought I shouldn't add Methylene blue to the main tank so now that I have two batches of eggs would you still recommend that I put them all in a breeder net, or would you say that I should put half in to another tank and treat them? <Whichever is most convenient. The good thing with fish is they spawn again and again, often only a few weeks in between times. So you can experiment. If you don't mind my sharing, I'd like to report on my Cory fry for others like myself that can't find much in the way of beginner stories. So, continuing from my other posts, when I moved the small Corys from the breeder net and into the larger tank I counted 74, and this was 40 days since the 120 eggs were first discovered. The filter intakes were covered with pantyhose so they wouldn't get sucked up and they all seemed to be active and finding their food. Despite daily partial water changes, the next couple days I found a few dead (various sizes, not just runts) and there must have been many more dead eaten by their peers in the next days as there now seems to be only thirty-some (of varying sizes) that seem to be holding steady. Back in the original main tank, 40 days after they had the first eggs, the adult Corys had more eggs (over 170) that stayed on the wall for five days until I assume they hatched and were eaten. I guess the parents and the Blackskirts didn't have a taste for eggs? On a side note, today one of the plump Blackskirts has been in a homemade cocohut all day and I have never seen them go in there (the huts are for the Corys). The fish's body looks normal, but I do wonder what it is doing (I assume NOT laying eggs as I have read that they scatter them carelessly). Thank you for the response today in the dailies. I should have mentioned that the tank I moved the Cory fry into IS bare bottom for now, because I thought it would be easy for me to spot any dead as they would disappear over the beige sand that I use. I didn't know about the potential for substrate to harbor bacteria that could hurt them. <Seems to be the case. The flip side is that a tank with lots of algae and Protozoans also contains lots of food that newly-hatched fish can eat. That's what baby fish would eat in the wild. I recently bred some gobies while I was on the other side of the world, simply because the eggs hatched in a tank filled with algae, and the baby gobies found enough to eat. There are still more than a quarter from the eggs surviving at 56 days in and I take comfort in believing they would fare much worse than that in the wild. I had mentioned a Blackskirt in the other tank that is hiding in a cocohut. It is still there after at least 27 hours and has missed feedings. <Odd. It might be ill, especially given its still not eating. Any other symptoms? Does it look swollen? Are its colours different to the others? It is one of seven and none of the others are larger (I think it has reached full size). When they charge and nip they have always seemed to do so evenly and they are darker than many photos of their kind (even over beige sand). I'm surprised they don't nip at the Cory Cats as the Cats nearly blunder into them. Sorry to bother you again, but wanted to say the Blackskirt finally came out of the cocohut and was being chased behind the heater and all over the place. When the juvenile Cory Cats grow larger I was going to move some of them in with their parents and these Blackskirts so there was already going to be some fish shuffling going on. I am wondering now if I will have to so some dividing and reintroducing of these Blackskirts as I guess the odd fish out would not be happy kept all alone either, correct? Since I have two batches of fry, one about twenty weeks old now and the other about ten weeks, I have a silly question. They are all different sizes. For example, one of the younger fry is the size of fry that are twice his age. I have only five all together and some of them graduated into the main tank about four weeks ago. Are their prospects of surviving with adult fish determined strictly by their size, or should their age also be considered due to mental development, etc.? Hi! Hope all is well with the crew members! I discovered what I believe are a handful of Peppered Corydoras (maybe Albino Corydoras, they are clearish/grey at this stage) fry in my tank tonight. After getting really excited, I've turned to a state of worry about the rapidly increasing population. I was under the impression that Corydoras were not that easy to get to spawn? pregnant in my opinion). They don't necessarily look like my Corydoras either, but more so than they resemble a Platy. They are also hanging out in caves and on the floor of the tank. In my experience, the Platy fry usually prefer the floating plants up top and would venture out occasionally mid and top level. But then again, I didn't notice any eggs in my tank either. Obviously, I have no real clue who these guys belong to. I am new to all of this (going on four months now) and my current 40 gallon tank that houses the Corydoras and Platies is currently recycling (after a medication attempt and misunderstanding about how long I could turn off my filters). It seems I am prone to make every available mistake possible in this hobby, so I am still having to do daily large water changes as my ammonia and nitrites are spiking. Anywho, my point is, if even my Corydoras are having kiddos in such a unstable environment, what will the reproduction rate be like when I get everything squared away with water quality? I'm having visions of tanks in every corner of my house and as cool as the fish/fry are, I'm not digging that idea. Can you advise my best bet in controlling my population? I've read you can resell them to local LFS, however I would prefer not to do so if I can avoid it as I'm not comfortable with how I see them treat their Bettas. <Do try posting on forums, such as the one we have here at WWM, or any other that appeals. Most have a "sale/swap" thread, and if you chat with people online, you'll be able to figure out who is a good fishkeeper and who is not. From there, you can offer up baby fish as freebies. I recently boycotted any LFS that sells Bettas in a cup and/or tinny tiny bowls. Maybe I should revisit this policy as it seems every store does this? And also, from what I've read, inbreeding isn't a good idea either. Can you suggest a plan of action for me? Maybe another type of fish that would help keep the fry population down? My PH is usually right at 7.6 and temperature steady at 75 degrees. Any other humane ideas (I'm not even sure adding predators is considered humane)? I hope this wasn't a stupid question.